The uninsurance rate continues to drop to record lows, according to polling from Gallup — and it’s declining the fastest among the communities who have historically lacked adequate access to health care. 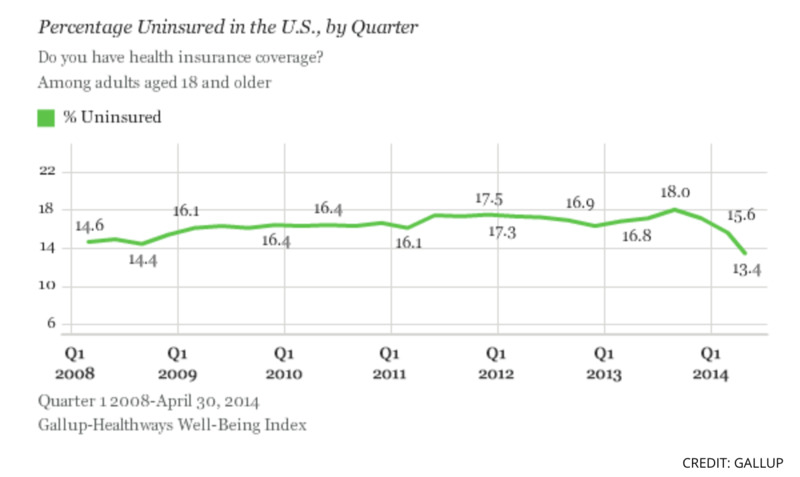 The data suggests that Obamacare is effectively expanding coverage to the people who need it the most. Although the uninsurance rate fell across all demographic groups, the researchers noted that it dropped particularly significantly among non-white and lower-income Americans. Those are the groups that were expected to benefit the most from the provisions in the Affordable Care Act, since they’ve traditionally suffered from higher rates of uninsurance. Compared to the fourth quarter of 2013, the uninsurance rate among black adults fell by 7.1 percentage points, the biggest drop among any group. Among Hispanics, the rate is down 5.5 points. And among Americans with an annual household income of less than $36,000, the rate also dropped by 5.5 points. But the recent gains aren’t being dispersed equally across states. More than 20 GOP-led states continue to resist Obamacare’s optional Medicaid expansion, a move that’s denying health care from millions of the working poor. Refusing to expand Medicaid disproportionately harms low-income people of color. Furthermore, the states resisting Medicaid already had higher uninsurance rates to begin with, and are home to people who tend to be poorer and sicker than the residents in other states. Unsurprisingly, previous research conducted by Gallup has found that the uninsurance rate is falling the fastest in the states that have embraced Obamacare, including its expansion of Medicaid. Meanwhile, the red states that have refused to lift a finger to further health reform have effectively ensured that residents there don’t know as much about their options under the law.